COMM 2305 students interview Dr. Mike Flores, Palo Alto College president. Photo by Ryan Ibarra. Dr. Ruben Michael “Mike” Flores will serve as the first Latino chancellor in the history of the Alamo Colleges District. The Alamo Colleges Board of Trustees named Flores the sole finalist for the position of chancellor on Feb. 8, and they approved his appointment in a special meeting on March 3. 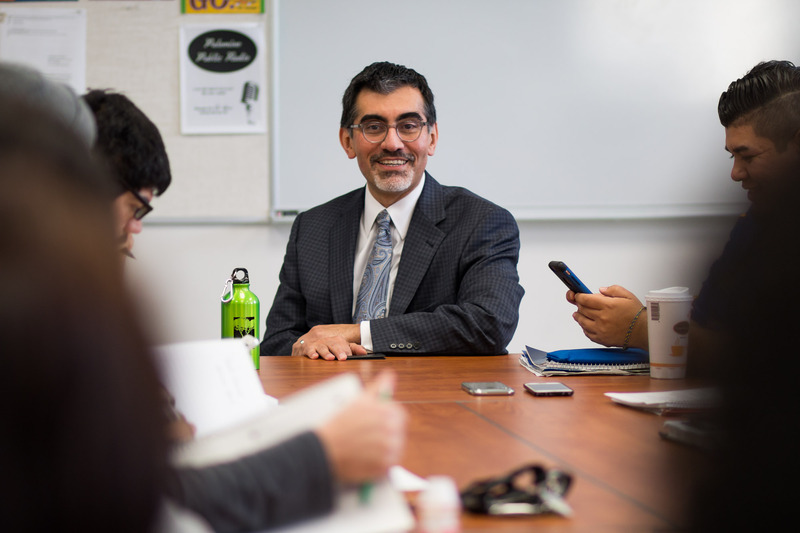 For the past five years, Flores has served as the president of Palo Alto College, where he has been employed since 1999. One of his major goals upon stepping into this new position is to advocate for more social mobility for students. Flores wants to ensure higher income earnings based on having a college degree. Second, after considering the number of students who do not finish college, Flores also has a goal of creating a stronger college culture in our community. He can already see progress being made through the seven Early College High Schools that filter into PAC. These students get the opportunity to take college classes along with their high school classes. When they graduate from high school, they will also receive their associate’s degree. This program is funded by a portion of property taxes that go to the Alamo Colleges, as well as the school district where the students live. Therefore, there is no cost to the students or their families. The oldest of three sons, Flores is part of a family that knows hard work. Both of his parents grew up as migrant workers. Hard labor taught them the value of an education, which they instilled into their sons. His parents gave him great examples to follow, as they became the first generation to attend college in their family. His father eventually pursued his career in education far enough to become a dean at San Antonio College. Graduating from Holmes High School, Flores doesn’t consider himself one of the top academic students. However, he still knew that he would attend college, where he received his bachelor’s degree in Political Science at the University of Texas at San Antonio. He went on to pursue his master’s at Illinois State University and then completed his doctorate in Educational Administration at the University of Texas at Austin. Flores met his wife, Martha, while attending school in Chicago, Illinois. They have been married for 20 years and have two daughters, Mara and Mia. He considers his wife and his parents his biggest mentors because of how they inspired him to pursue his education further. His wife is also a first-generation college student. While Flores will miss the daily conversations and relationships that he has built with his colleagues and students at PAC, he is looking forward to all the new encounters with students, faculty and staff across the district. Some of the best advice ever given to Flores was from his parents. They taught him the Golden Rule, to treat people the way you want to be treated. Flores’ father has since passed away. Before he died, he was interviewed by the San Antonio Express-News, and he said that he hoped that his son would one day become the first Chicano chancellor of the Alamo Colleges. 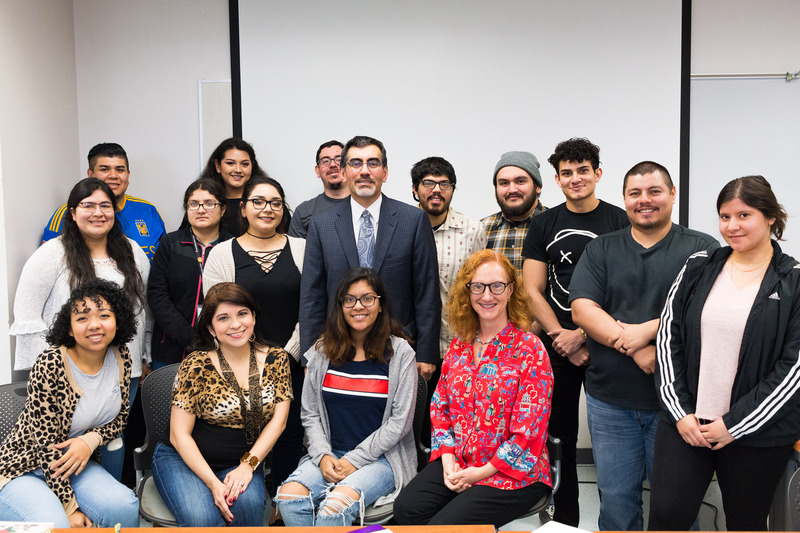 Palo Alto College COMM 2305: Editing, Layouts and Headlines students and Dr. Denise Barkis Richter, Communication professor, meet with Dr. Mike Flores to discuss his plans as chancellor of the Alamo Colleges District. Photo by Ryan Ibarra.